Experience neighborhood-style living at TownePlace Suites by Marriott Columbia Southeast/Fort Jackson. 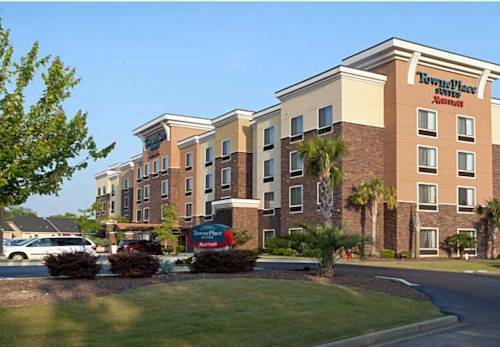 Our extended-stay, Columbia hotel is just minutes from Fort Jackson and the University of South Carolina. We're also in close proximity to Shaw AFB, McEntire Joint National Guard Base and Providence Hospital, as well as Colonial Life Arena, Williams-Brice Stadium and the SC State Fair. Stay a while in spacious studio, one-bedroom and two-bedroom suites, featuring a full kitchen and custom closet by The Container Store. Every suite also offers luxury bedding, a full-size sofa bed, 40" LED TV and free WiFi. Start your mornings with free hot breakfast, grab a quick bite from our In a Pinch Market or grill like a champion with our Weber stainless grill. Swim in our outdoor pool, stay in shape at our 24-hour fitness center or keep active at our sports court. We're also pet friendly (fees apply). Whether you're staying for a day or a month, our TownePlace Suites hotel near Fort Jackson has everything you need.